The internal organs of a nursery stage sea-bream (0.3g) suffering from pasteurellosis (under a stereoscope). The spleen is enlarged and pseudotuberculi are already evident. The liver is inflamed and the intestines swollen. Growing sea-bass suffering from pasteurellosis. Congested inflamed liver and splenomegaly with plenty of pseudotuberculi in the congested splenic parenchyma comprise the typical necropsy findings of pasteurellosis. The swim bladder is usually not distended, so the majority of the dying and dead fish sink to the bottom. Pasteurellosis of a young bream (4g) with splenomegaly and yellowish fluid in the gut. 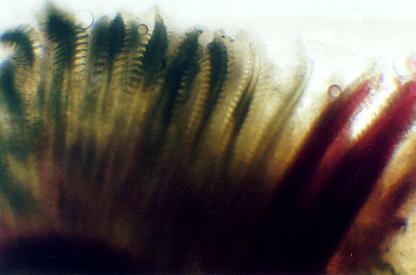 Gills of a sea-bass suffering pasteurellosis under low magnification. 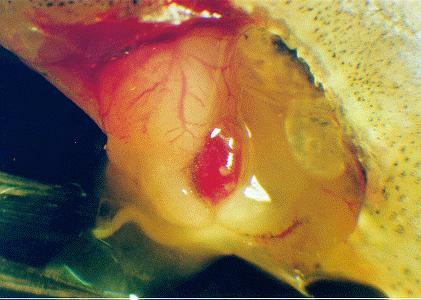 Wide area of gill epithelial tissue necrosis next to congested, inflamed tissue.